Previously, I’ve talked about how the Inner Hebridean islands of Scotland, particularly Iona, have inspired me. This time I though I would show you some of my studio wall, which is covered in things that inspire me, pieces I like, some past work that I’m really proud of, and generally a lot of blue! 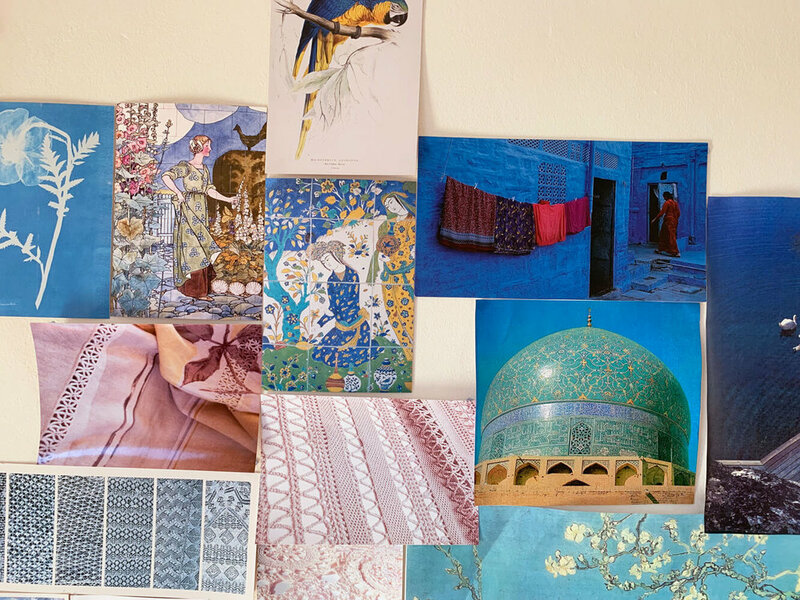 It’s not a mood board- I don’t change the inspiration on my wall for every new piece. These are pieces that just help create a workspace that I love to be in. 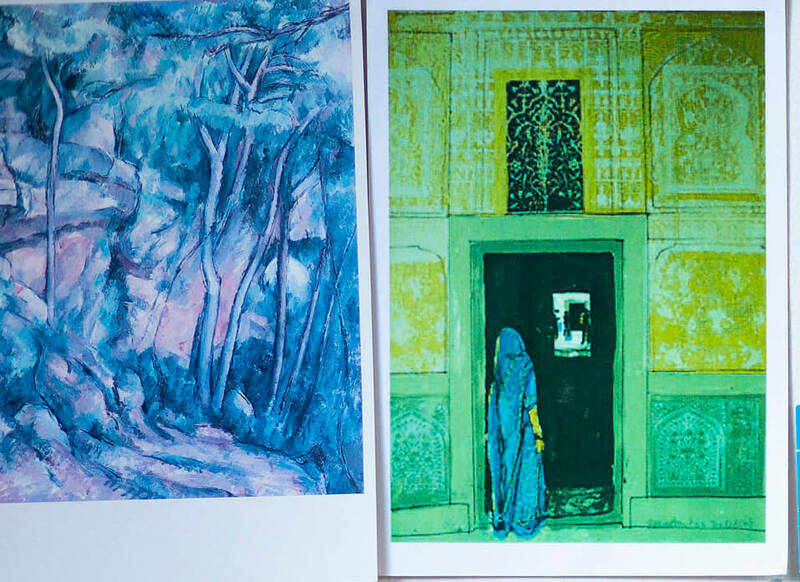 A mix of Van Gogh, Cezanne, Degas, Monet, Bakst, and my own work and photos from trips abroad. The largest image is a painting by Van Gogh. Not only is it in a really lovely shade of blue, it has blossom in it, and I love being reminded of Spring. Below the Van Gogh, you can see some Monet. I have always loved impressionist paintings, and I’ve been to see Monet’s Water Lilies at Musée de L’Orangerie in Paris a couple of times- they’re incredible! They also have a lot of blues in them! To the left of the Monets, and under the Van Gogh, are some photos I took in Takijistan. I was visiting Dushanbe for work, and these beautiful buildings were in the botanic gardens there. I’ve always loved the Islamic art style, and the scale of the decoration between those pillars was really inspiring. I see it as large lace. On the far right, at the top you can just see a bit of a photo of a scarf I programmed on a digital knitting machine in my third year of university. It took me the whole term to get it to work, so I’m particularly proud of it! Underneath that is a bit of Degas- one of his ballerinas. I love dance, and one of my first jobs was making costumes and being wardrobe mistress for a dance company when I was still at school. It was so much fun, and I like the idea of capturing movement. Degas captures the fabric transparencies particularly well I think. Below that is a tiny faded Flower Fairy picture by Cicely Mary Barker. I love all her flower fairies, and this one of the gorse fairies is particularly sweet. It is said that no matter what the season, there is a bit of gorse flowering somewhere, so I always look out for flashes of yellow! To the right of the Van Gogh, at the top and bottom, are two crochet pieces I did as part of a project a few years ago. They were huge, and in yarns that I wouldn’t normally use, and I still really like them! Then moving left at the bottom is another slightly faded picture by Leon Bakst. Leon Bakst was a Russian painter who turned his skill to theatre and costume design, particularly famed for his costumes for the Diaghilev Ballet Russes. He clearly loved pattern and colour, and I find his illustrations very inspiring, and for a while I wanted to design costumes too. Above Bakst is a postcard that I found and liked- there are quite a few of these! These postcards have something I like about them- the colours, patterns, architecture, and I often find them when I’m at museums. A mix of blues and patterns I love, Previous work, and shetland lace. There is also a postcard of a print by Jenny Martin, who was my tutor at Leith School of Art. The colours have changed over the years, but she has a great sense of colour and pattern, and having a little bit of her work on my wall, reminds me of some of her advice when I was a student, and helps keep me inspired. Beside This print to the left is a Cezanne- initially I didn’t like Cezanne much, but after spending time really looking and learning about his work, I now really appreciate it, and rather enjoy the angular lines. This last photo at the bottom right is one of my favourites, from a trip to Nepal when I worked for People Tree. These fantastic women are all amazing knitters, and it was such fun working with them. They had their tea breaks on the roof of the building, sitting on bits of hand tufted carpet- tester squares for the carpet making part of the fair trade business they were part of. All these images make up the wall of colour in the studio. It makes it a much more cheerful place to create!